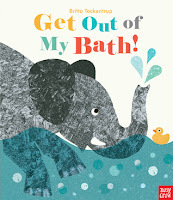 Abby the Librarian: Preschool Storytime: Bath Time! 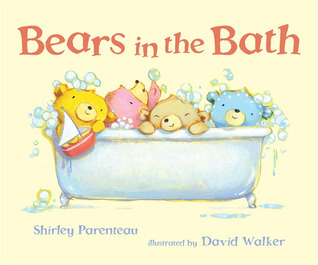 Book: Bears in the Bath by Shirley Parenteau, illustrated by David Walker (Candlewick Press, 2014). Not only is this book super cute, but the rhyming words help kids hear that words are made up of smaller sounds. The book also uses some great vocabulary like "grimy" and "sleek". 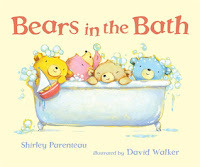 Plus, it's a situation that kids can relate to - getting dirty and taking a bath - which captures the interest of our youngest readers. Felt Rhyme: Five Elephants in the Bathtub (source: Jbrary). This is a silly rhyme, which I love, and it incorporates actions that are great for practicing motor control. We also practice counting with rhyme. Book: Get Out of My Bath! by Britta Teckentrup (Noisy Crow, 2015). This is a book that incorporates a lot of action and contains a lot of silly surprises, which is always fun to read. Scarves: Whenever we do a song with scarves, I like to warm everyone up with a few little activities first. I pass out the scarves and let everyone choose which color they want. Then we wave them high and low, we wave them fast and slow, and we throw them into the air on the count of three. These activities are not only fun, but kids are practicing listening and following directions as well as motor skills. Song with Scarves: This is the Way We Wash Our Head. With this song, we're practicing vocabulary by identifying different parts of our bodies. With preschoolers I like to use some that most kids know (head, shoulders, feet) and also some words that they might not know like "chin" and "thighs". Other body parts to practice: elbows, wrists, hips, calves, ankles. Scarves: With preschoolers, when we put our scarves away I ask them to bring their scarves up to me when I call their color. We're practicing color knowledge, following directions, and approaching an adult who is not a family member (all school readiness skills!). 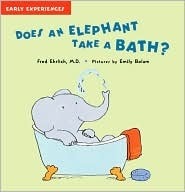 Book: Does an Elephant Take a Bath? by Fred Ehrlich (Blue Apple Books, 2005). This is an easy nonfiction book that talks about how different animals keep themselves clean. Including this book gets a little science knowledge in there (plus, kids loved animals! ), as well as the vocabulary of the different animal names. Felt Story: Dog’s Colorful Day (adapted from the book by Emma Dodd, Dutton Juvenile, 2001). This is a fun felt story that's great for talking about different colors and for practicing counting Dog's spots. If I have a small group, I'll pass out the spots and have kids bring them up and put them on the felt board. Today, I had a fairly large and excited crowd, so I just put them on myself. Blocks - we almost always have these available for play time. 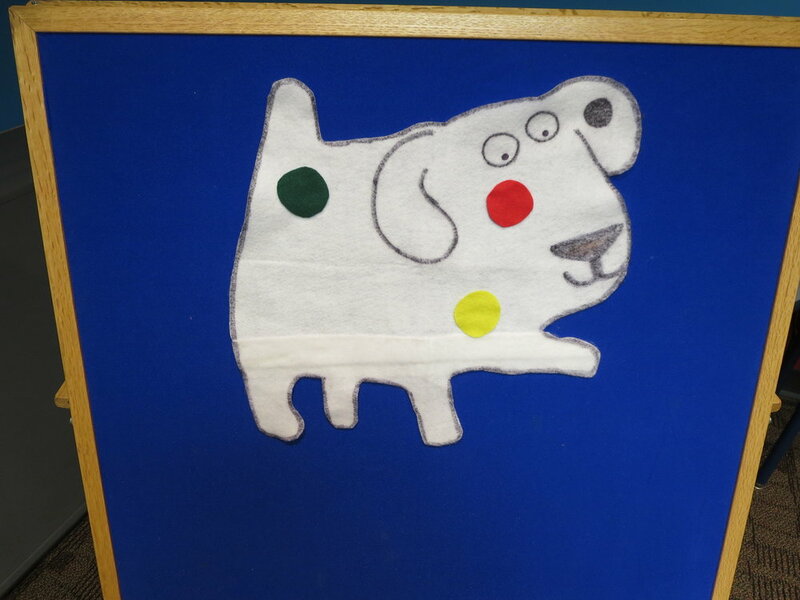 Felt Board - I put Dog's Colorful Day out with all the spots for the kids to play with. Some kids spent literally 20 minutes putting all the felt spots on and taking them off again. 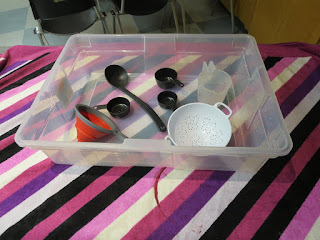 My tubs did have water in them during storytime! I was a little nervous to do water play, but it actually went very smoothly. I spread out towels on the tables, which caught any spills outside the tub. The kids had a blast playing with the various items I brought in from my kitchen and playing with the water animal toys from our Toddler Time collection. Since I had several towels at the ready, cleanup was fine, too. I did not fill up the bins very high with water - I had maybe and inch and a half of water in each tub. Altogether, it was a really fun storytime! 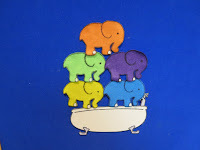 What are your bathtime storytime favorites?